LifeReader - was established in 2009 with the sole aim to provide people just like you with the very best Online Psychic Reading experience possible. We all know that life can be extremely tough at times, whether it be love, relationships with family and friends, or career & finances. LifeReader Psychics are here to guide you through these trying moments and to support you in restoring the harmonious and happy existence you deserve. Just remember that the past does not equal the future! 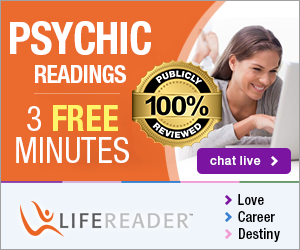 All LifeReader Psychics are hand selected and must pass our thorough quality assurance process before their services are offered to our Customers. Readers are specialists in their fields and can be searched for by expertise type: Tarot Card Readers, Psychics & Clairvoyants, Astrology & Horoscopes, Love & Relationships, Mind Body & Spirit. Earn 35% commission on sales.